DAR-8 Assistant Regional Director Ismael Aya-ay and Mayor Eric Pajulio (4th and 3rd from left) cut the ceremonial ribbon during the turnover and inauguration rites of two rehabilitated roads in Matalom, Leyte’s remote villages. MATALOM, Leyte – Farmers here see economic opportunities as two remote villages in this third-class municipality can already be penetrated by all types of vehicles after the Department of Agrarian Reform (DAR) rehabilitated the roads in going to Barangays San Vicente and President Garcia. 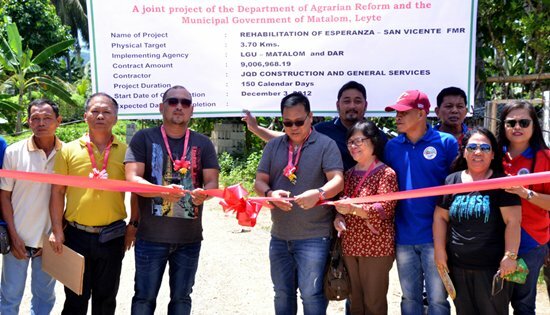 About five thousand residents in these areas, wherein more than 900 are agrarian reform beneficiaries (ARBs), are benefited by these projects with a combined cost of P18.6-million shared by the national government thru a loan from the Asian Development Bank (ADB) and the local government unit (LGU).